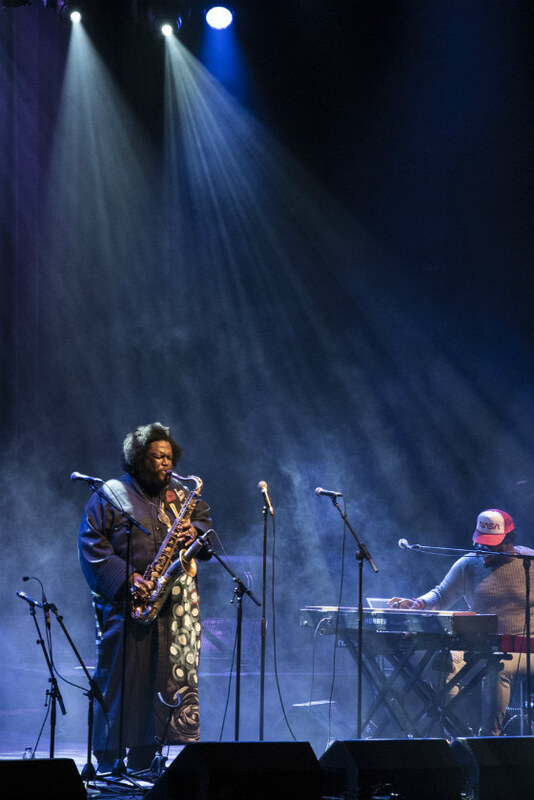 Kamasi Washington's current tour is one of the most unusual jazz outings in years, if not decades. As a member of the semi-official West Coast Get Down, the saxophonist is one of several L.A.-based jazz musicians defying expectations of when, where and how audiences interact with the genre. He and his cohort are some of the most sought after jazz musicians in L.A., but also work closely with artists like Kendrick Lamar, Flying Lotus and Thundercat. They're no strangers to the label "The Wu-Tang Clan of Jazz," and that applies as much to their collaborations as their string of excellent solo albums. It was Washington's two solo albums, The Epic and Harmony of Difference, that were on display last night before a sold-out, rapturous audience. This was the first of two back-to-back shows for the night, and while some artists might play two carbon copy sets in this situation, Washington and his band took the opportunity to play some rare songs and jam. Recent live staples like "Change of the Guard" and "Henrietta Our Hero" were absent, while songs like "Re Run Home" and "Askim" were infused with more funk and percussion. Washington took the stage flanked by a handful of West Coast Get Down members, including trombonist Ryan Porter and keyboardist Brandon Coleman, both of whom Washington has worked with since they were young. Washington met Porter, he explained to the audience, when they were in a music education program together and Washington overheard him playing from around a corner. "He had so much soul, I thought he was an old guy who had been through a lot of stuff — like lost a couple wives, had a few kids die," Washington quipped. When he introduced Coleman, he said that he was the kind of musician who could take any song, no matter how good, and make it better, and that's how he earned the nickname "hot sauce." The lifelong camaraderie and respect between these musicians shone through their music and made the night feel all the more special. As everyone took turns soloing, Washington would stand back and watch with genuine glee, his smile radiating across the room. When it seemed like the sense of family couldn't get any stronger, Washington brought out his father, soprano saxophonist Rickey Washington, introducing him as "The man who taught me everything I know." He remained for the rest of the set, kicking things off with a funk-tinged rendition of the jazz standard, "Cherokee." While Kamasi Washington remained clearly, if modestly, in control of the whole night, Coleman and vocalist Patrice Quinn came very close to stealing the show. Where other vocalists might wait in the wings for their songs to come up, Quinn remained on stage across the whole set and added improvised vocal layers to instrumental songs and danced throughout — you could say she served as a backing dancer or interpretive dancer if either of those terms actually captured the energy she added to the night, even when she wasn't singing a word. Coleman added prodigious keyboard vamps and layers of Headhunters-esque funk to songs that were otherwise quieter on record. When the band covered one of his songs, "Giant Feelings," his bouncy and quick soloing brought some audience members to their feet. The interplay between Coleman and Quinn also added an unexpected facet to the sound, as Coleman fleshed out Quinn's vocal parts on "The Rhythm Changes" with a vocoder. The highlight of the night came with "Truth" from Harmony of Difference, a song with five distinct melodies that come together in beautiful and unexpected ways. "Diversity is not something to be tolerated, it's something to be celebrated," Washington said, introducing the song. The closing chords brought the audience to their feet. If Washington and the West Coast Get Down can keep bringing this kind of enthusiasm to jazz, we're in for a long, beautiful ride.